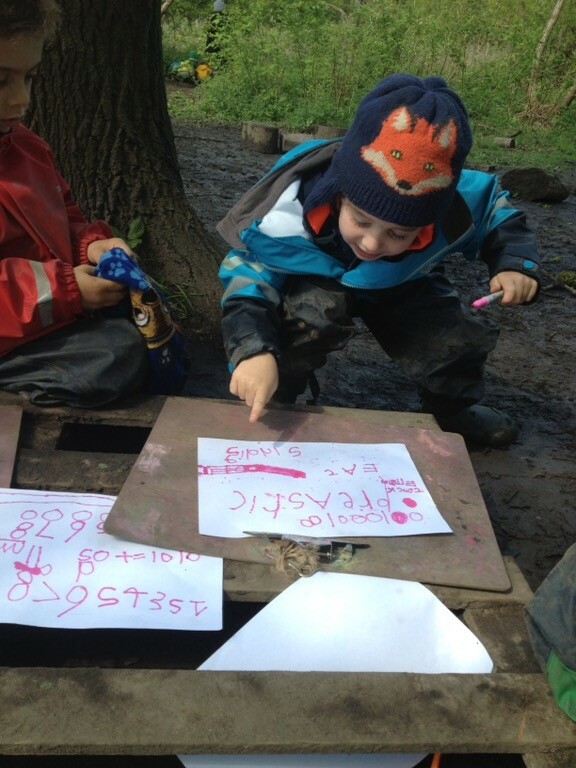 We are so fortunate in our forest nurseries to have a high adult to child ratio that allows us to fully embrace ‘in the moment’ planning. 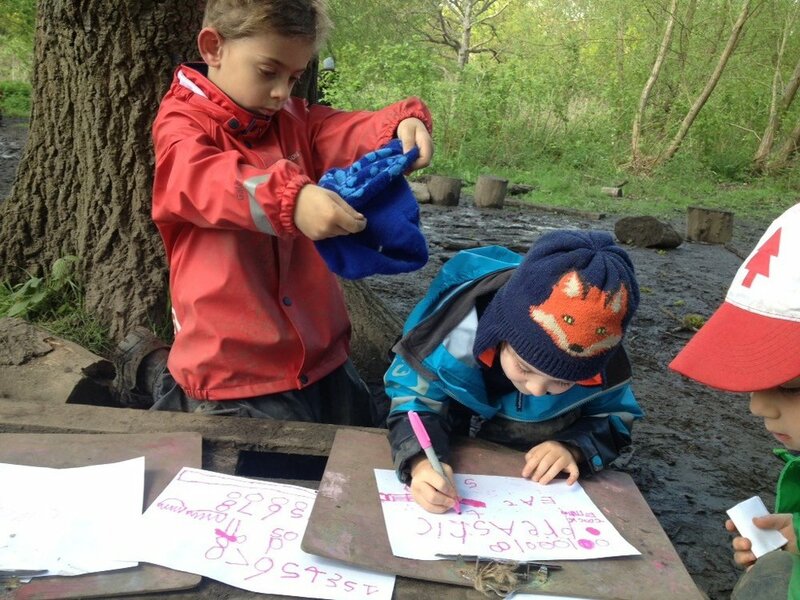 Rather than plan out in advance each term what themes or activities we are going to enjoy with our children, we are free to let our in-depth knowledge, close relationship with each child and their passions and interests lead our play, changing every day or every week as dictated by our children’s needs and the weather. Every now and then a day completely highlights what a privilege this is. Recently we had one of those days. A group of 3, 4 & 5 year old boys came together, led by the 5 year old boy, and decided they wanted to build a time machine. Time machines have been discussed and gently experimented with over the past few months with these boys, but today they meant business. Today was the day for building their time machine to allow them to go back to ‘just after the big bang but in time for the dinosaurs’. A day that is structured and planned out in advance wouldn’t allow time for a day like today to happen and children need this freedom and flexibility. Firstly and most importantly, they needed to create their blueprint. Breaking the stereotype of boys and literacy, these boys (and a couple of girls) sought paper, clipboards and writing materials and spent a long period of time drafting out their plans. 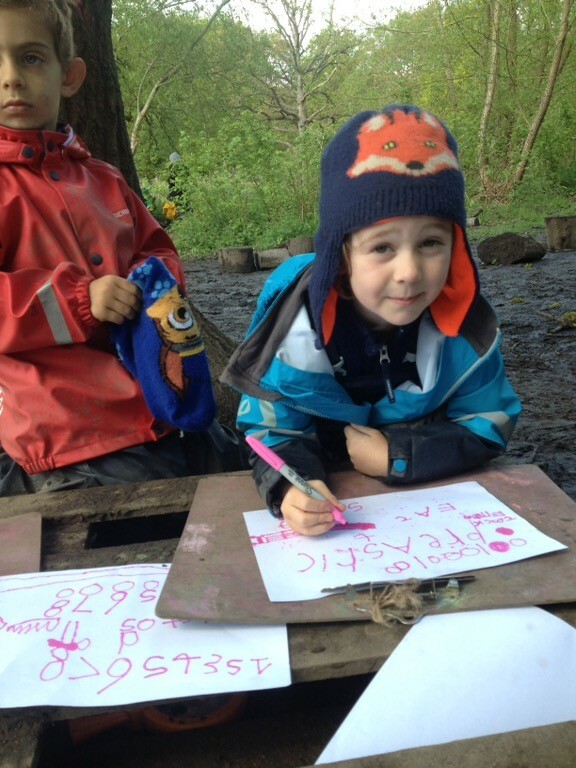 There were drawings, labels, written instructions, all meaningful and purposeful writing. Following this they sought out the materials required to create their time machine. Working collaboratively they assembled all of their components and built their time machine. They rode in their time machine back to the dinosaurs, revelled in the excitement of it all, had their faces painted like dinosaurs then went on dinosaur hunts around the forest from their vantage point of 40 million years ago. 6 hours of unbridled fun and excitement, laughter and giggles. 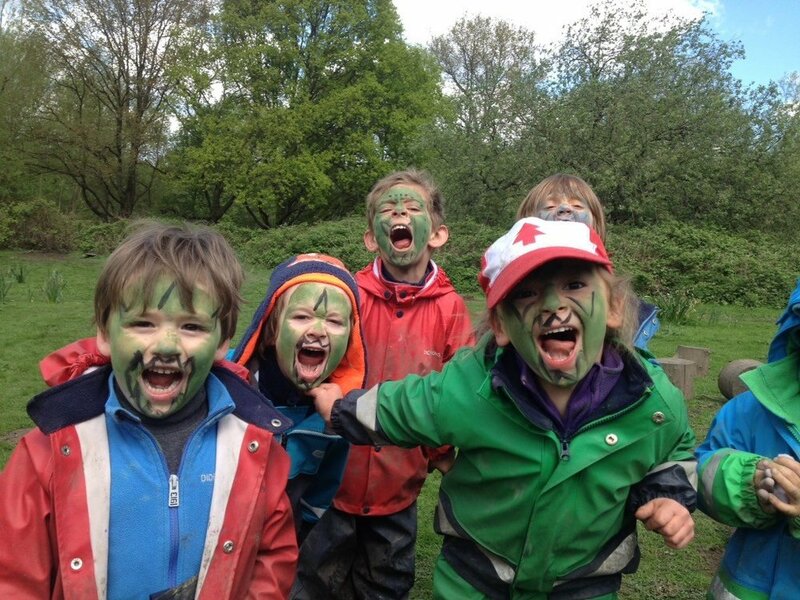 The absolute joy of a day playing like this in the forest cannot be underestimated, for children and educators alike. For teachers more used to traditional forms of learning, it may be difficult to see the learning. Our adults however, not only had enormous fun with a day like today but added real value to the play and observed fantastic learning. From modelling sounding out letters in the writing of the blueprints and assisting in spelling out of words and correct formation of numbers and letters, to confirming mathematical calculations, to suggestions and comments about the structure of the time machine, to wonderings out loud about the different geographical features of the various historical periods and, in addition to facilitating and encouraging collaboration, sustained conversations and critical thinking, our adults today contributed enormously to a fun and engaging activity. What followed after the activity is one of those moments that anyone working with young children will recognise as one of those moments when you laugh in sheer delight at the wonderful world they inhabit, with limitless possibilities, bound only by imagination. After the days activities were recounted, it was lamented as an observation rather than a complaint, that the time machine hadn’t worked ‘for real life’. I repeated this phrase back as a question, ‘oh, your time machine didn’t really work?’. I wondered whether the children had realised time machines don’t exist. Or maybe that one built of bits of wood, rope, tree stumps and a bin lid may not be a formula for success. Oh no. It wasn’t that time machines don’t exist. It wasn’t that wood, rope and a bin lid weren’t the right materials. It was that they haven’t figured out YET (Carol Dweck’s ‘Growth Mindset’ in action) how to make the time machine go fast enough to really go back in time. They need more speed! One of the children had recently visited a museum where he saw a propeller for a World War 2 plane that he believes was operated by winding a spring really tightly, locking it, then hitting a go button which released the spring to make the propeller spin ‘really super fast!’ which in turn made the aircraft fly. So logically, what these children believe they need next for successful time travel………..is a giant spring! I absolutely love it. I love their curious minds. I love their imagination. I love that their spirit and enthusiasm, determination and drive are not subdued by failure. I love that they are confidently exploring and hypothesising and subsequently testing out their hypotheses’. This may be play at it’s most fun, but it’s play that is leading our children to becoming future scientists, entrepreneurs, explorers. To becoming people who can think critically, creatively and who never give up. This isn’t to say that we never plan activities. Of course, following reflection with the children and our adults, we do plan activities we think will extend and interest the children based upon their current passions. 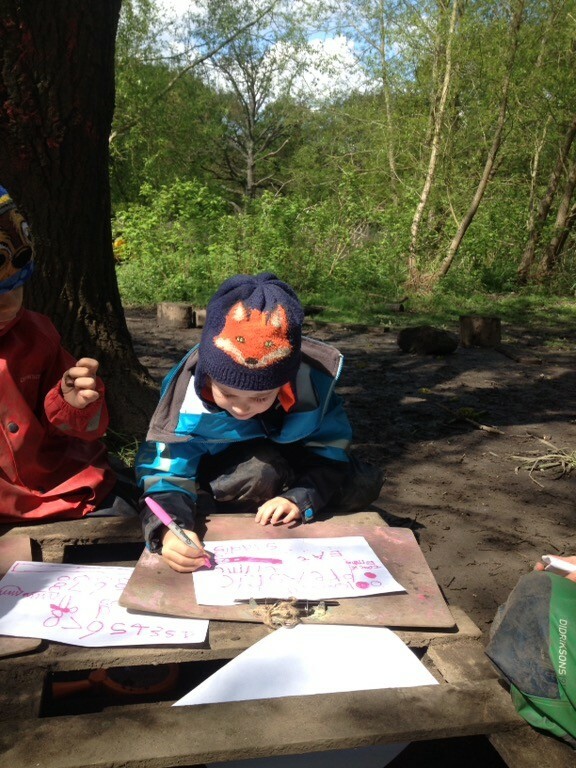 Children in one of our forests are currently enjoying playing with music whilst a focus on tool-work has been sustained over a long period of months. So a natural next activity being considered for them is to use tools to make their own instruments. 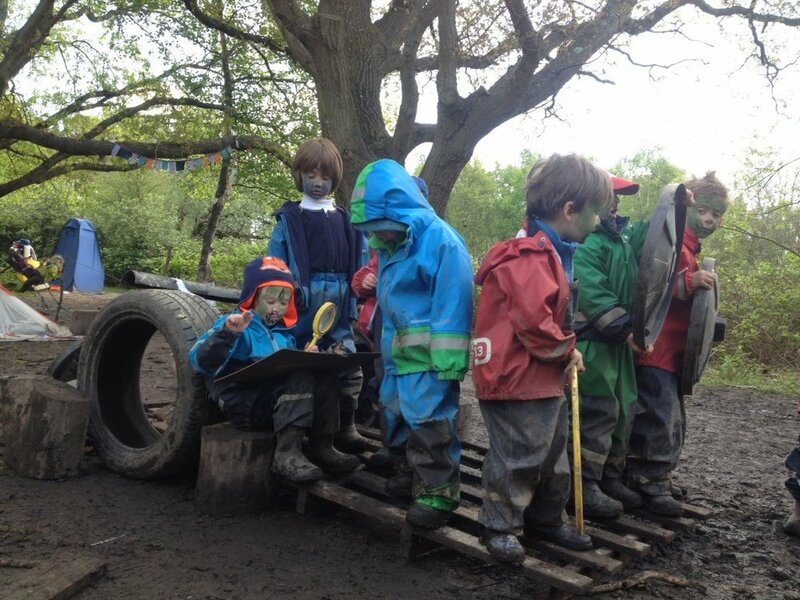 All activities, whether we have planned them or, more often, that have stemmed from the children who have fantastically vivid imaginations and incredible ideas for play, are optional. No child ever fits in with us, we fit in with each child. Giving our children the freedom and time to self-direct their learning, remaining guides on the side to facilitate, extend, challenge and sustain learning is for us the best formula for success. We are so grateful we have the opportunity and freedom to provide this experience for our children. Older PostIndie's First Day in the Forest!